His dissertation topic was "The prosodic structure of Latvian" — a full .pdf is here. Appropriately, the document's dedication was "To a free and independent Latvia". And a former Lithuanian head of state is a musicologist: https://en.wikipedia.org/wiki/Vytautas_Landsbergis (not clear from the English-language article, but the German-language article describes his scholarly work on some Lithuanian composers). Seems to be a Baltic thing. Looks like an old-world thing to me. In Finland, Edvin Linkomies (1894–1963), professor of "Roman literature" (as the university chair was called) was prime minister in 1944-1945. Most of his academic publications seem to deal with linguistics rather than literature (for instance, ablativus absolutus or the etymology of "augur"), and he also authored a grammar of Latin which was used at least up to the 1970s. Thanks for a continually interesting Language Log. Funny that you would say that, because the author of a famous* etymological dictionary of Lithuanian was named Fraenkel. * In the circles where this kind of thing can be famous. Mostly comparative IEists. The US rule, with its distinction of "natural-born" and "naturalized" citizens, is very rare globally. Usually, citizens above some age are generally qualified to run for president. Austria's president (a former professor of economics) was born in Estonia, and arrived in Austria when he was about 6 years old. It's fascinating that the wikipediaists using English (for the entry linked above) neglect the detail that the wikipediasts using Latvian (for the entry linked in this comment) provide. No 1990. līdz 1996. gadam K. Kariņš turpināja studijas Pensilvānijas Universitātē, iegūstot doktora (Ph.D.) grādu valodniecībā. Paralēli studijām darbojies kā asistents un mācībspēks, pasniedzot dažādus valodniecības kursus un izstrādājot elektronisku izrunas vārdnīcu angļu, vācu un arābu valodā. 1995. un 1998. gadā K. Kariņš bija vieslektors Latvijas Universitātē, pasniedzot kursus sociolingvistikā bakalaura un maģistratūras studentiem. In parallel with his studies, he worked as an assistant and lecturer, teaching various linguistic courses and developing an electronic dictionary of pronunciation in English, German and Arabic. In 1995 and 1998, K. Karins was a guest lecturer at the University of Latvia, giving courses in sociolinguistics to undergraduate and graduate students. But he was certainly part of the CALLHOME group, led by Cynthia McLemore, that also produced conversational transcripts and lexicons in English, Chinese, Japanese, and Spanish. @ Johanna Laasko – you're right, it's an old-world thing. It hasn't always been very happy, of course (Joseph Goebbels was a PhD in German literature). @ David Marjanović – thanks for the familial reference. The reason for the requirement that the American president be native-born was that the founders thought that that would insure their allegiance to the country rather than to Britain. Even if that did make sense at one time, it's thoroughly obsolete now. That post headline is politically controversial, considering this precedent. @ myl: In support of Krisjanis’ resume details mentioned in the Latvian Wikipedia, he did take over responsibility for the lexicon project in its final year as I turned my attention to other things. It’s not enshrined in the citations because it was post-publication. As I remember, he was finishing his dissertation at the same time — all quite cheerfully, I might add. As someone who was born in Wilmington less than seven months after PM Kariņš, I am delighted by the small-world connection. ("Area Man Gets Hired for New Job In Baltics.") I'm pretty sure his Delaware birth certificate doesn't have any of those fancy diacritical marks on it, however. Assuming the English translation of the Latvian constitution I googled up is accurate, there is a bar against anyone with dual citizenship serving as president, but no comparable restriction for prime minister. Whether he would be eligible for the presidency if he renounced his U.S. citizenship (in the fashion that would be effective as a matter of U.S. law) is a question of Latvian law I don't know the answer to. Latvian law does currently give automatic citizenship (subject to doing the paperwork and providing satisfactory documentation) to the foreign-born children and grandchildren of Latvians who had gone into exile/diaspora during the Soviet occupation. To the extent the "natural-born" concept has cultural/political resonance in present-day Latvia, I would think it would encompass those children of the diaspora who relocated to their ancestral homeland to help it rebuild after the Red Army left. It's interesting that even though he was born in the US and didn't move to Latvia until after college, he evidently speaks Latvian well enough to be elected Prime Minister there. His parents must have spoken it to him at home. Because I was not a sufficiently aggressive sociolinguistics fieldworker back in my teens I have no idea how much she spoke Latvian at home growing up, but I think her family sent her to a Latvian-American-focused summer camp that may have had a language-reinforcement aspect to it, and googling tells me that there is to this day, decades later, a Lutheran church not too far across the state line in Pennsylvania that still has services in Latvian and which her family may well have attended. Indeed, back when the now-PM was working on his dissertation at Penn, going to that church or at least to post-service coffee hour would probably have been a good way for him to find a critical mass of native speakers to check prosodic-structure things with. Obviously, in any immigrant community there's a wide range in how much parents encourage (and provide opportunities for) fluency in the heritage language and how much individual kids pursue versus resist opportunities to maintain/enhance heritage-language fluency. 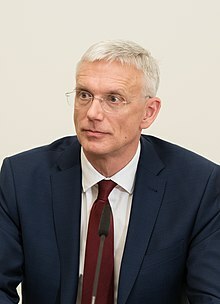 Latvia is very much not a full-on jus soli jurisdiction, which creates problems for the substantial part of the Latvian-born population who descend from non-Latvians (mostly ethnic Russians) who moved in during the Soviet occupation without complying with the theoretical immigration/naturalization rules of the Latvian government in exile. Do we know he'll use his powers for good? A prescriptivist is a descriptivist with an army and a navy. J. W. Brewer, I’m wondering whether I know the family you’re talking about. Weird that there are two Wilmingtonians of a similar age on the same boutique blog site! If you wouldn’t mind, give me shout at neil dot dolinger at gmail dot com. A lot of Latvians in diaspora moved back to Latvia after the end of the Soviet occupation, with many taking government posts. I knew someone in college who did that. Her family had kept close ties to Latvia and spoke Latvian at home. I attended her wedding where her non-Latvian husband had to learn his vows in Latvian as well as saying them in English.